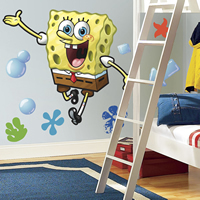 Delight Spongebob enthusiasts of all ages, big and small, with oRoomMates' removable and repositionable Spongebob Squarepants wall stickers. Like all RoomMates, these officially licensed wall stickers are removable, repositionable, and reusable. They can be applied to any smooth surface, then simply peeled away when you're ready for a change. Stick them up on walls, doors, windows, mirrors, furniture, headboards... you name it! They won't ruin your paint or leave behind any residue when they're removed.